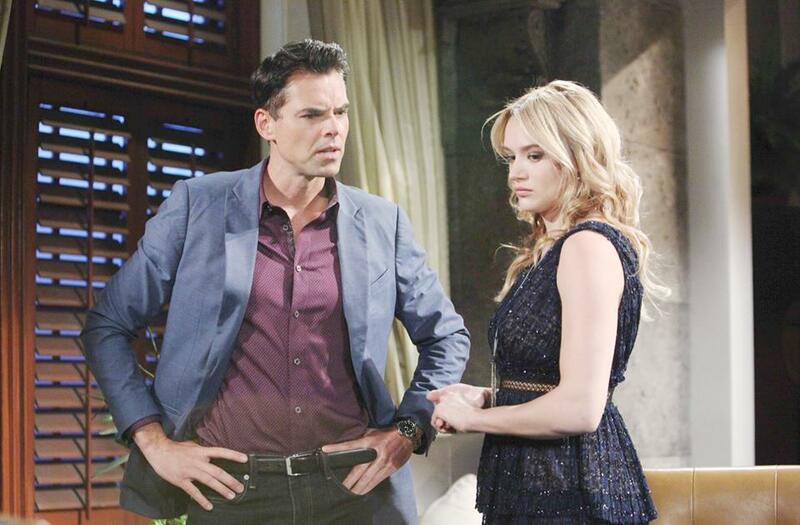 Summer's return to Genoa City is not good for Billy on "The Young and the Restless." HOLLYWOOD—The fearsome four finally spilled the tea, at long last Phyllis, Nikki, Sharon and Victoria shared with Nick all the dirty details behind J.T. Hellstrom’s demise on “The Young and the Restless.” Why it took the ladies almost a year to share the truth with a close confidant who would not turn their back on them I will never know, but Nick did take the news in stride. So if you’re doing the math that means we have 8 people who know the truth, actually make that 9. There is someone who has been watching the ladies and the ranch heavily. Like I said last week, I was certain the culprit was J.T. I no longer sense that anymore. As Nikki cleverly pointed out, it is someone very close to them. So who could it be? I have two guesses: either its Chelsea back to get a bit of revenge, and she would absolutely want to stick it to Phyllis for ruining her relationship with Nick or its Adam Newman. Adam seems like a major wildcard, so I’m not too certain what his reasoning would be for the shenanigans. Chelsea seems to have more of a score to settle with the ladies, so she seems like a more viable candidate in my personal opinion. So what is the problem? It seems too easy, and whoever this tormentor is I want to be floored when the revelation comes to light. One thing that is certain, the person has an ability to bond with children, i.e. Katie having a chat with a mystery guest who is not seen. Victor suspected it to just be imagination, but I’m certain there is much more going on here America. I love when suspense slowly builds, but the payoff has to be worth it otherwise it’s a major letdown. Let’s talk a bit about romance because it seems to be the topic of discussion in Genoa City. Kyle and Lola are happy, but the sudden return of Summer Newman to the mix changes it all. Summer was a pest the last time she was in town, and seems to be up to her old tricks yet again. I mean sleeping with your mother’s boyfriend is just low and dirty, and the audience still has no evidence pointing as to why she did it. Making the situation worse is she has plans to woo Kyle, yet again, by using Fen to make him jealous. Is it working? To a degree it seems so. Earth to Summer, Kyle does not want you. He is happy with Lola and things are going well for them so buzz off. Summer’s arrival will only create more tension between Phyllis and Billy if you ask me. Speaking of Billy, his love triangle with Victoria and his brother Cane is creating all sorts of drama. I feel Billy and Vikki belong together, but she seems to have stronger chemistry with Cane. There is a lust these two have for one another and they can’t seem to escape it no matter what they do. Then we have the complicated love triangle involving Rey, Arturo and Mia. Mia and Rey renewed their vows, and Arturo decided it was time to pop the question to Abby who happily accepted. Look, we all know Arturo betrayed Abby with Mia, we’re just waiting for that secret to come out. Mia is showing her jealous side by getting drunk during Abby’s engagement dinner, and giving every reason in the book to Rey that she still holds a torch for her ex. Why can’t the guy catch a clue I will never know? I sense that we have a pregnancy in the works. Mia wasn’t feeling too good after drinking too much, but I think that was a sly cover from the writers to hint that someone might have a bun in the oven. This will indeed cause major friction if true, because when the truth comes out Abby will be livid and so will Rey, which could present all sorts of chaos for viewers. Sweeps are underway, and after a disappointing November, I’m hoping “Y&R” makes a huge bounce back for February! Next articleLeo Stark’s Mom Bursts Into Salem!